Sen. Debbie Stabenow's revival of the proposal comes about two weeks after two other Michigan congressmen proposed expanding the number of electric vehicles and plug-in hybrids eligible for the federal tax credit. 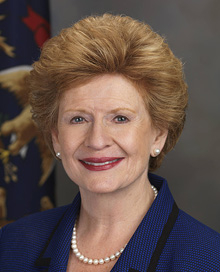 DETROIT -- U.S. Sen. Debbie Stabenow today reintroduced a bill that would provide a $7,500 rebate to buyers of plug-in electric vehicles at the point of purchase. Current EV buyers get the $7,500 incentive when they file their taxes, forcing them to wait as long as a year for the tax credit. Stabenow, D-Mich., also wants tax credits for investments in charging stations for businesses that buy medium- and heavy-duty hybrid trucks. Depending on the truck's size, the credit could be worth between $15,000 and $100,000. The proposal includes more funding to develop the U.S. advanced battery industry. The Charging America Forward Act was introduced last August, but never passed into law. Stabenow's revival of the proposal comes about two weeks after two other Michigan congressmen proposed expanding the number of electric vehicles and plug-in hybrids eligible for the federal tax credit. On Jan. 26, U.S. Rep. Sander Levin, D-Mich., proposed legislation in the House and on Jan. 31 his brother, U.S. Sen. Carl Levin, D-Mich., introduced a similar bill in the Senate that would increase the per-manufacturer cap on the $7,500 tax credit from 200,000 vehicles to 500,000. The rebate was started as part of the Recovery Act of February 2009. It is available on five vehicles -- the Chevrolet Volt, the Tesla Roadster, the Nissan Leaf, the CODA sedan and the Wheego LiFe. It is phased out after a manufacturer sells 200,000 units. General Motors Co. has said the cap could hinder future sales of the Chevrolet Volt, which sells for $41,000, with delivery, before the credit. “We are pleased to see Senator Stabenow's legislation that integrates all of the components necessary for successful acceleration of electric vehicles in the marketplace,” GM spokesman Greg Martin said in a statement. “We look forward to working with Congress on legislation that leads to widespread adoption of electric vehicles." President Barack Obama has pledged to expand r&d in batteries and electric drivetrain technology, including a 30 percent increase in federal grants. “With more research and incentives, we can break our dependence on oil with biofuels, and become the first country to have a million electric vehicles on the road by 2015,” Obama said Jan. 25 in his State of the Union address. The administration also is extending initiatives to improve electric vehicle infrastructure in U.S. cities. As many as 30 communities across the country would be able to receive grants of up to $10 million each to install public charging stations, electrified parking space access and fleet conversions.